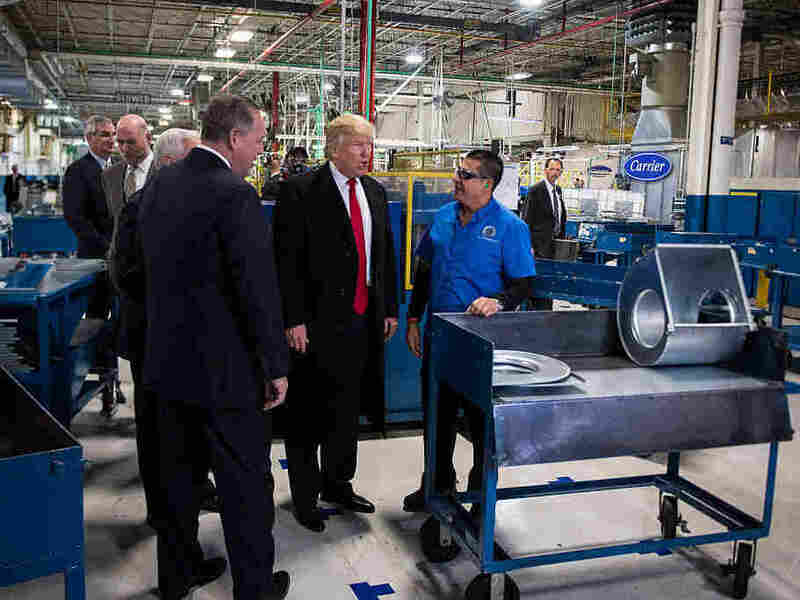 Donald Trump Tweets Attack On Union Official Who Questioned His Jobs Numbers An Indiana union official says Donald Trump overstated the number of jobs he saved at a Carrier plant. He soon found himself on the receiving end of Trump's Twitter feed and harassing phone calls. President-elect Donald Trump tours the Carrier Corp. in Indianapolis on Dec. 1. The president of the union representing Carrier workers has challenged Trump's claims about how many of the plant's jobs will remain in the U.S. The president-elect seemed to be responding to criticism from Jones that he had inflated the number of jobs saved at Carrier's furnace factory. Trump had boasted that his intervention with Carrier persuaded the company to preserve more than 1,100 jobs in Indiana that were previously moving to Mexico. But the actual number of jobs that will be staying in the U.S. is about 800. The remaining jobs were never expected to move. Jones told the Washington Post that Trump had "lied his a** off." "I think he ought to make sure he gets all the facts straight before he starts talking about what he's done," Jones added in an interview with CNN. He also pointed to Trump's history of opposing union organizing efforts in his own hotels. The union official, who voted for Hillary Clinton, quickly found himself on the receiving end of a Twitter attack from the president-elect. "If United Steelworkers 1999 was any good, they would have kept those jobs in Indiana. Spend more time working — less time talking. Reduce dues," Trump wrote. Trump's tweets were followed by a series of threatening telephone calls to Jones. "Nothing that says they're gonna kill me, but, you know you better keep your eye on your kids," Jones told MSNBC. "Things along those lines." Jones shrugged off the harassing calls and union colleagues rose to his defense. "Chuck Jones is a man of integrity who ALWAYS puts the interest of workers first," the Indiana AFL-CIO tweeted. "Chuck is a hero not a scapegoat," the United Steelworkers union added.